Brides can have their pick of the most unusual outdoor wedding locations - museums, aquariums, even the Grand Canyons! Any outdoor wedding venue that you choose to exchange your vows makes a statement about you as a couple. If you are one of those couples that are not bound by tradition, read on! Outdoor wedding sites can range from the most common venues like the beach, park, garden to the most extreme ones like scuba diving, sky diving, or even a roller coaster ride! Below are more options for outdoor wedding venues that veers off the beaten path. 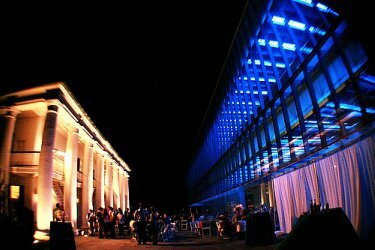 Believe it or not, museums do offer wedding event services and packages and they are a great place to host your outdoor weddings. 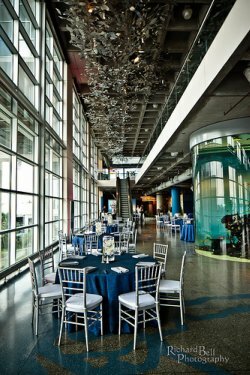 Depending on what you and your fiance(e) are into, there are different kinds of wedding packages that museums can offer. For instance, for a San Diego outdoor wedding, the San Diego Maritime Museum offers a very unique wedding experience for you and your groom by exchanging vows aboard their turn-of-the-century Berkeley ferryboat. It offers a full array of services for both your wedding and reception needs. You might not think so, but zoos and aquarium places are great wedding locations too! If you are an animal lover and loves all those exotic animals and endangered species, consider this for a wedding location. Usually your fee for the facility helps maintain the educational programs and animal habitats. Find a zoo or aquarium that's located by where you live. Larger facilities typically have more options available for weddings and generally have a larger animal population. You can find zoos online at the website for the Association of Zoos and Aquariums. Want to add a little magic to your wedding? Maybe a little adventure? How about a big splash? Then you might want to consider a theme park wedding. One thing to consider about theme park weddings is the time of year theme parks are open. While most theme parks in California and Florida are open all year round, many theme parks are open seasonally, many opening in March, April and May, and closing at the end of October.